Ok, everyone loves a Black Friday Sale, right? Saving you some cash on this monumentous day in American history. 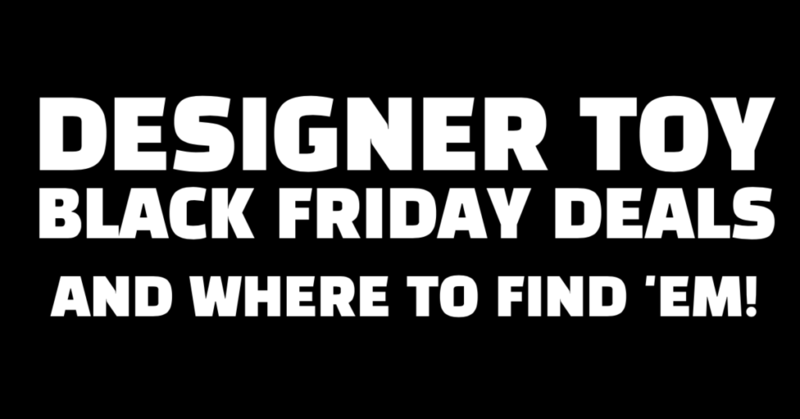 We figured we would scour the Designer Toy world to find you the best Black Friday sale deals! If we see any more during the day/weekend, we’ll update this page! 20% off 100+ Art Toys, Action Figures, Customs, Vinyl, Plush & Resins! Use code BFCM to get 20% off! BFCM discounts in effect at midnight after Thanksgiving (Nov 22) thru midnight on Cyber Monday (end of day on Nov 25). EXTRA BONUS #1: Reward points are DOUBLED from Nov 23 – Nov 26. EXTRA BONUS #2: Top customer receives a FREE HOODIE and 2 runners-up receive a FREE T-SHIRT, your choice of styles from the Tenacious Apparel Shop. Whole bunch of items up to 75% off. Most are 50% off. No code required. Just visit their Sale page (URL above). No code required for Black Friday sales on Collect & Display. Extra 10% off Clearance Items HERE with BLACKFRIDAY2018 code! Simply apply the code “BF2018” upon check out to have free shipping applied to your entire cart! 20 points per $ spent! With every purchase above $200, you get a pack of secret sticker set for free! 35% off store wide. Kyle never runs sales on his store so this is BIG. Discounts on everything. Ends Sunday or when sizzle sells out! $50 off original Nerviswr3k sculpts from DesignerCon. Now through to Cyber Monday. Bigshot Toyworks – https://bigshottoyshop.com/discount/BFCM18 (40% discount applied at Checkout). That means: ALL Four Horsies figures and swag, ALL FUnicorns, ALL Southern Fried Gentlemen, ALL Gnomeboys, both Monkeys with a Gun, and all the other items available in the Bigshot Toyworks shop.